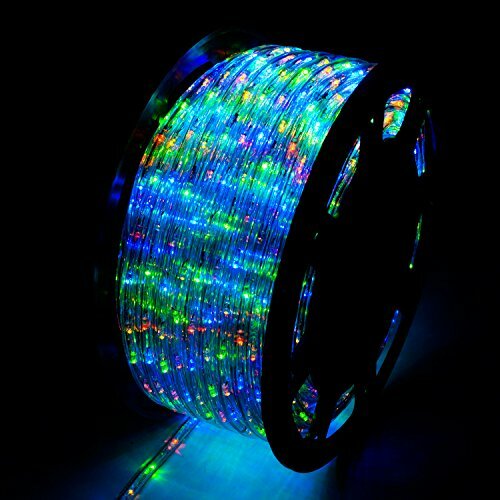 WALCUT Flexible 150FT Crystal Clear PVC Tubing LED Rope Light Indoor/Outdoor Boat Decorative Party Christmas Holiday Business Restaurant Light Kit 110V (Multi-Color) by WALCUT at IGWT. MPN: USLI1003COLOR. Hurry! Limited time offer. Offer valid only while supplies last. Specs: 1. Color: Colorful 2. Total Length: 150 Foot 3. LED Bulbs:1620 4. Beam Angle: 45° 5. LED Quantity:36 LEDS/m 6. LED Bulb Spacing:1'' 7. If you have any questions about this product by WALCUT, contact us by completing and submitting the form below. If you are looking for a specif part number, please include it with your message.